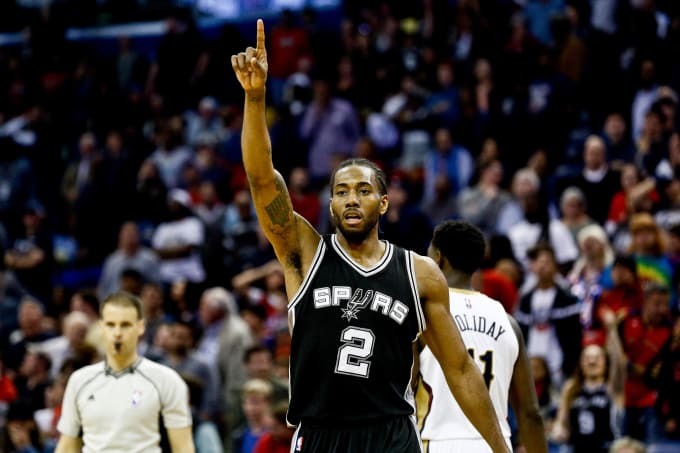 Has an MVP talent ever flown under the radar quite like Kawhi Leonard? Yes, he’s the reigning two-time Defensive Player of the Year. And sure, it was him who finished as a runner-up in MVP voting last season, to Stephen Curry, who had just wrapped up one of the best individual campaigns the NBA has ever seen. But Leonard still isn’t talked about in the same vein or with same frequency as LeBron James, James Harden, Russell Westbrook, et al. The stone-faced combo wing prefers it this way, no doubt. He epitomizes the San Antonio Spurs with his distaste for attention. Plus, the MVP race has been boiled down to Harden and Westbrook in the Twittersphere. Leonard isn’t the only player who is being glossed over. Leonard profiles as the NBA’s seventh-most valuable player this season, according to NBA Math’s total points added. Everyone in front of him has saved more points on the defensive end, but none of them, with the exception of maybe LeBron James and/or Giannis Antetokounmpo, is someone opposing offenses actively plan around. That’s what makes Leonard so special, and it’s also what forces him behind some of these names in the field. He doesn’t take the same pleasure in offensive accolades as he does in his defensive performance—assuming he enjoys himself on the court at all. The Defensive Player of the Year award might be something he appreciates more than the MVP, which often emphasizes offensive contributions over everything else. That the Spurs de-emphasize the role of the individual, no matter who you are, is actually a testament’s to Leonard’s real value, because he’s entered the MV discussion anyway. Even when he’s flying under the radar, he’s a top-five candidate, who will end up with the votes to prove it, all while generating the noise of someone who isn’t in the mix at all.